Researchers are poring over thousands of tiny artifacts - including a child's milk tooth - found in a southern Italian cave that appears to have been shared by both Neanderthals and early man. The caves of Roccia San Sebastiano, which overlook the Tyrrhenian Sea north of Naples, are being combed for traces of those who once lived there. On the slopes of the medieval fortress of Montis Dragonis, near Mondragone in Caserta province, researchers say they've uncovered layers of history, rich in early historical finds. 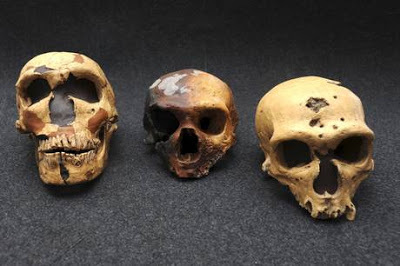 The discovery is telling them "a story of the evolution that goes from 40,000 to 20,000 years ago, when the cave was used for uninterrupted time by Neanderthals and Sapiens," says prehistoric archaeologist Carmine Collina. Within perhaps the oldest layer, dated at between 40,000 to 39,000 years of age, researchers discovered the milk tooth of a Neanderthal child and the remains of many tools, such as tips and splinters, made by Neanderthals. "The tooth was lost when the individual was of an age comparable to that of our children at 10 years," says paleoanthropologist Giorgio Manzi, from Rome's Sapienza University. The age of the tooth is especially important because it helps to mark the final stage in the life of Neanderthals in Italy, and the arrivals of homo Sapiens, says archaeologist Marcello Piperno, also of Sapienza University. Last year, researchers found two milk teeth discovered at the site of Grotta del Cavallo, in Italy's Puglia province.